Tuesday night’s episode of The Real Housewives of Beverly Hills was one for the record books and the explosive confrontation between Kyle Richards, Lisa Vanderpump and Ken Todd sets the tone for the remainder of the season! But before I dive deep into the dark pits of the Radar Online #PuppyGate scandal, the episode kicks off with newlyweds, Denise Richards and Aaron Phypers, reminiscing on their wedding day while opening gifts. Denise mentions how much her daughter, Lola, is happy to now have a complete family. They both seem really happy. I wish them well. Over at the Vanderpump Dogs Rescue Center, a film crew is on hand to interview Lisa Vanderpump for “Puppy Bowl,” a huge event that her beloved pup, Giggy, has been selected to compete in. After the Puppy Bowl interview — Lisa, her husband Ken Todd, and Dr. John Sessa discuss Resolution 401, a legislature (on congress floor) to end the dog meat trade. The trio talk about Teddi Mellencamp’s upcoming Soul Cycle fundraiser event to benefit Vanderpump Dogs. And despite Teddi acting like a b*tch lately, Vanderpump is hopeful that she won’t cancel the event in light of their recent falling out. Meanwhile, Teddi is home eating breakfast and wearing a towel wrap on her head when Dorit Kemsley phones to inquire if Teddi has seen a “highly exaggerated” Radar Online article about her adopted dog, Lucy Lucy Apple Juice, ending up in a kill shelter. Dorit whines talks about people finding out that she tortures animals is a bad person — and Dorit swears Lisa Vanderpump planted the story to make her look bad. Teddi agrees and the two slam Vanderpump for the remainder of the convo. Teddi’s charity event is underway. All the ladies with the exception of Vanderpump attend, she’s busy hosting an event at Vanderpump Dogs in celebration of Congressman Alcee Hastings bringing the resolution to Congress. Resolution 401 passes, and the crowd is exhilarated. Once Teddi’s charity event is finalized — Dorit, Lisa Rinna, Kyle Richards, Denise Richards, Erika Girardi and Teddi all go to lunch and yes, #PuppyGate is on the agenda. Dorit weeps about the Radar Online article and she’s convinced Vanderpump is behind it — Teddi, Rinna, Kyle, and Erika all agree. She tells the group that animal lovers are threatening her children. The ladies rehash tales about Vanderpump being a master manipulator, who orchestrated the dog saga to hurt Dorit. Denise is on the fence and remains neutral, Kyle however, plays good cop/bad cop but ultimately throws her “friend” under the bus. After the Radar article was published, Vanderpump spoke to TMZ to defuse the Radar story and defend Dorit, but Kyle and Teddi think it’s a calculated move on Vanderpump’s part and they feel that the tone of her interview was suspicious. Kyle arrives at Villa Rosa and she engages a bubbly Vanderpump in small talk before going in for the kill. Kyle explains that she went to lunch with the ladies and the Radar Online article was discussed. “If you read the article, it sounds like it comes from your camp,” Kyle says. Vanderpump responds, “didn’t even read it properly,” then refers to the TMZ article, where she’s seen on camera denying any feud. “I’m in a really bad position here,” Kyle continued. “As your friend, I wanna say, ‘That is not true! I don’t believe that! '” This sets Vanderpump off and it was on and popping after that. At this point, Ken enters the kitchen and tells Kyle that’s what she should’ve done. “But I don’t feel that, Ken!” Kyle fired back — reiterating that everyone thinks Vanderpump is a liar. Vanderpump mentions speaking to TMZ to defend Dorit and Kyle responds, “It seems as if you wanted to get ahead of it so that people believe you instead of Dorit in this whole argument.” This enrages Ken and he screams, “YOU’RE NOT HER FRIEND!” in Kyle’s face. Next week on The Real Housewives of Beverly Hills Kyle Richards tells the other ladies about her fight with Lisa Vanderpump and the group grows further apart from the restaurateur. The Real Housewives of Beverly Hills airs Tuesdays at 9:00 p.m. ET, on Bravo. 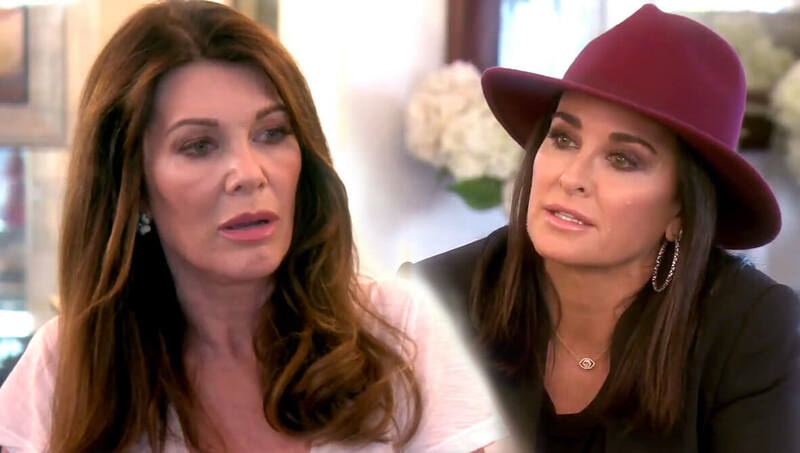 Kyle Richards vs. Lisa Vanderpump Fight Explodes Tonight — Get Details & Watch Here!